In the first photo there is a very nice centrepiece. Large glass vase filled with eggs in the base is very nice example for table decoration. On the top are wonderful flowers in pink shades. Add any flower you like to make a spring look of your table. 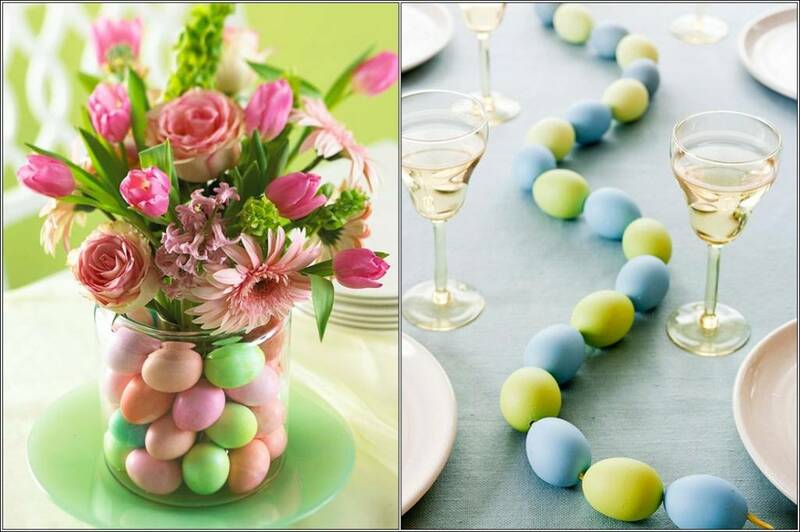 The second picture shows a garland of eggs placed over the table. The easiest table décor idea can help a lot especially if you are decorating in ‘last minute’ . This decoration is in ameandering manner. A lot of different centerpieces that are putted all together are shown in the first picture. If you like to have more fulfilled table, you can also use this example and use more than one centerpieces. Using baskets, you will get more space, and still have a good decoration. Eggs wrapped in flower and petals ribbon are very unique centerpiece. It is shown on first picture. Use this idea to create something different but still very stylish. On the second photo we see egg cups placed in eggs shells that are filled with lilac flower arranged to fit in. Using this great idea that is showed in third picture can be used as a great décor item. You can also fill the egg shells with candle wax and wicks and you will get this centerpiece. On this two pictures are shown a tree with eggs and a bunnies. On first picture there is a tree decorated with butterflies and eggs hanging from it. It is very interesting and in Easter spirit. If you want to have this as your Easter decoration, it costs $46.99. While on the other photo, we see bunnies. They are intricately crafted with hand. You can have them for $22.99 and it will be a cutest ever table decoration. Spring atmosphere must be a part of Easter. First photo is creating a first look impression of an egg. Very nice combination of colors is presented here. Yellow eggs who are in the middle and white flowers that are surrounding them is real relaxing combination and great table centerpiece. 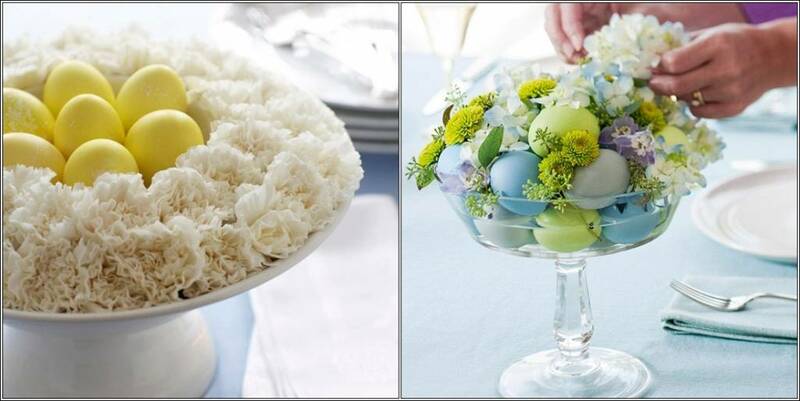 Centerpiece made up of the combination of flowers and eggs put together are shown in the second picture. It is also a good combination of colors and give the good, peaceful atmosphere. This idea is also given by Martha Stewart. She has given an advice that cup cakes can be used as a centerpiece also. Great example is shown on first picture. Floral silhouettes of a hen and a chick that are on the second photo, perched over a grass and egg settings are for those of you who are courageous. Bunny with carrot carriages are shown on the third picture. Also an idea that Martha gave as a very good example of table centerpiece. Candy balls in happy candy colors is always something good to see. Make a centerpiece like this one on the picture. 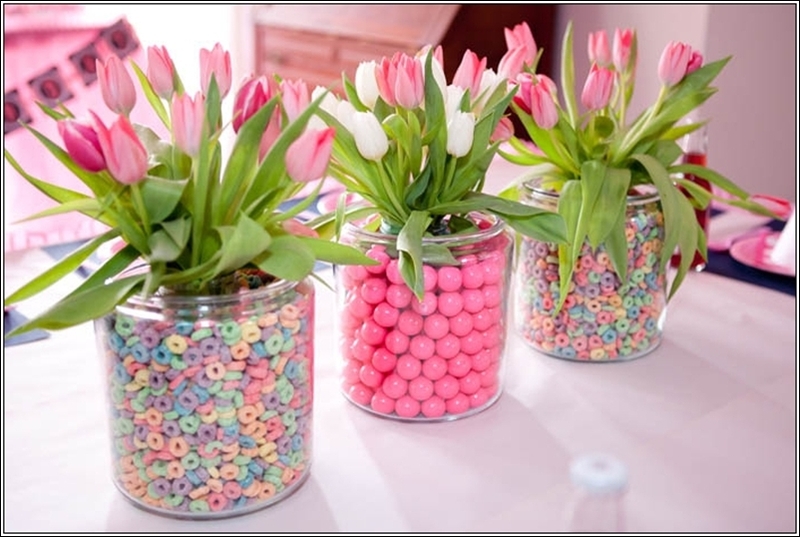 You can fill glass vases combined with tulips with a candy balls or coloured cereal. Girls are gonna love this.